Lou Loves Beauty: Latest Haul Update - Swatches and Mini reviews. Latest Haul Update - Swatches and Mini reviews. 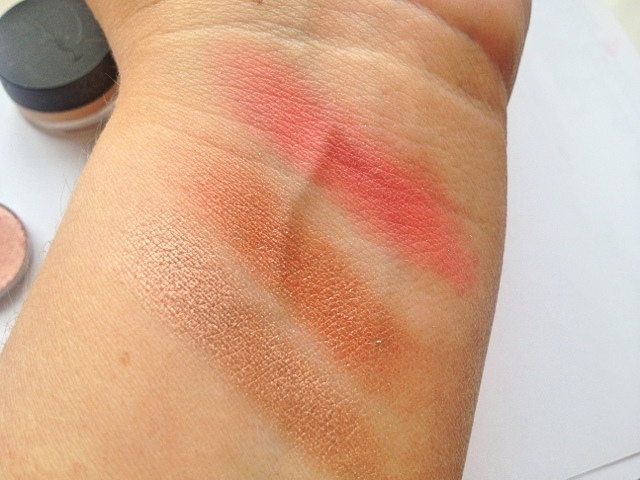 Today I will be swatching and doing a little review on some of the make up I purchased in my Latest Haul Post. I have been loving and using these all week and they have quickly found their way into my daily make up routine. 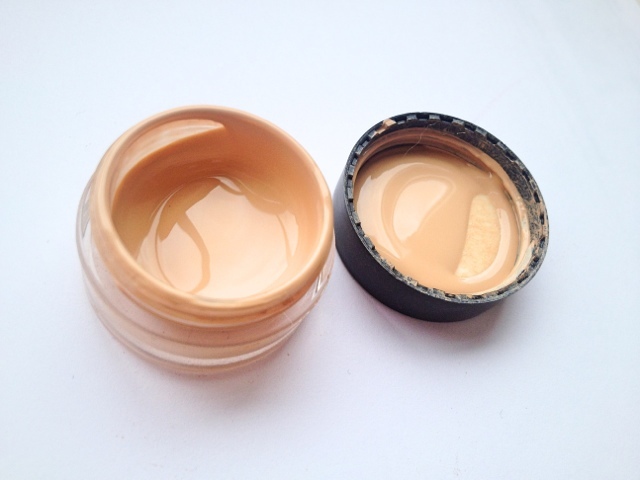 I received a sample of Mac's Face and Body foundation in shade N3 when at the Mac counter this week. I have heard good things about this and wanted to try it out. The consistency is very watery but thickens when worked in with a brush, the coverage is light - medium but can be build up without looking cakey. I really love the finish of this foundation, it feels like you're not wearing anything and gives a beautiful glow to the skin, not fantastic for hot weather but brilliant for giving a healthy sheen to the skin. I will definitely be repurchasing a full size of this. 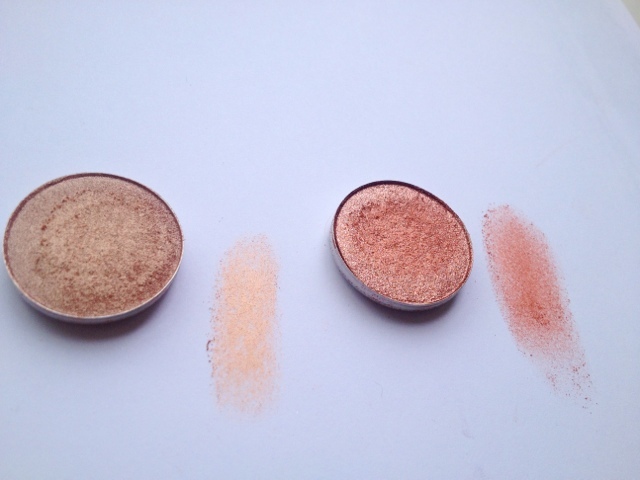 When at Mac I purchased two eyeshadows to add to my pallet, they are both lovely to work with. All That Glitters is a gold toned beige with shimmer which is fab for applying allover the eye or in the inner corners to brighten up a smokey eye. The other colour a got was Mythology, a gorgeous copper that I have been applying allover the lid on days that I am in a rush. 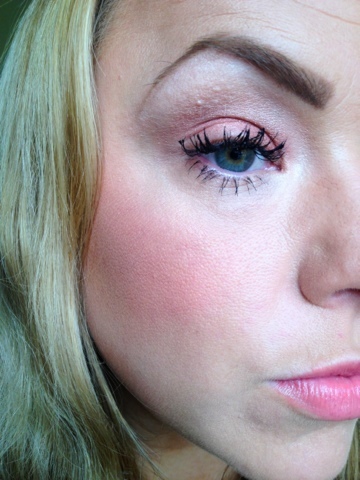 The last product and the best, is my new blush from Bobbi Brown in Coral ( yes another coral blush!) This was an impulse buy when I was at the counter getting my under eye corrector and concealer, I always gravitate towards the blushers and saw this and had to buy it. The colour is a rich coral with red under tones which means that you any need to apply a small amount as it can look quite bright otherwise. I was a little worried when I got this home and had a better look as it does contain gold shimmer that looked rather prominent in the pan, once applied the shimmer almost disappears and your left with a lovely flushed glow that I'm sure will complement most skintones. Below is an everyday look using the products mentioned above. 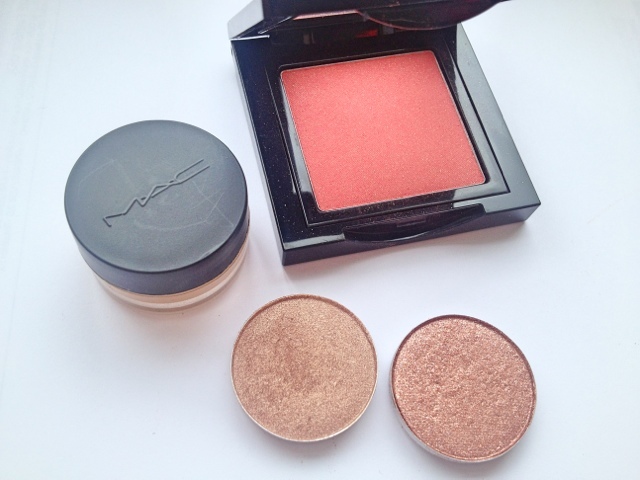 Face -Mac Face and Body, Bobbi Brown Coral Blush, Nars Laguna bronzer, Bobbi Brown Under Eye Corrector and Concealer. Eyes - Mac Mythology on lid, All That Glitters in the crease and Blanc Type on the brow bone. Brows done with HD brow pallet in Bombshell with a Mac 263 brush. Lips - Revlon Lip butter in Juicy Papaya. 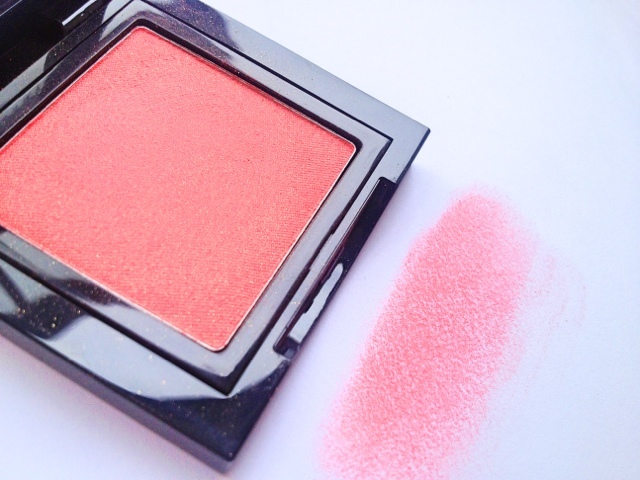 I love the blush shade!